Sometimes when everything is going great and I'm feeling super excited and motivated about my knitting I need to have challenging and interesting projects on the needles. Other times, when things are busy and hectic and it's all I can do to keep up I need to have simple and easy projects on the go. Like socks. I just sit and knit around and around without thinking, almost trance like, it helps to keep me balanced. It's all very zen. I'm in one of these moods these days. 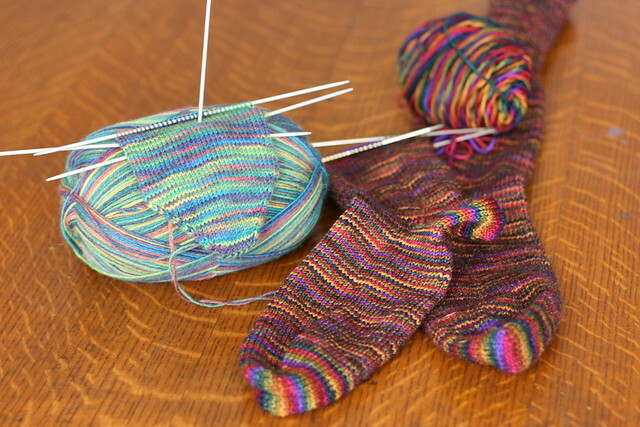 I cast on for one pair of toe up socks, it's going well, so I cast on for another. This second pair is being knit is Zitron Trekking xxl in a very pretty green/blue rainbow type colourway. It brings me tons of happiness. Before I hit my sock groove, I was in a hat and mitt groove. 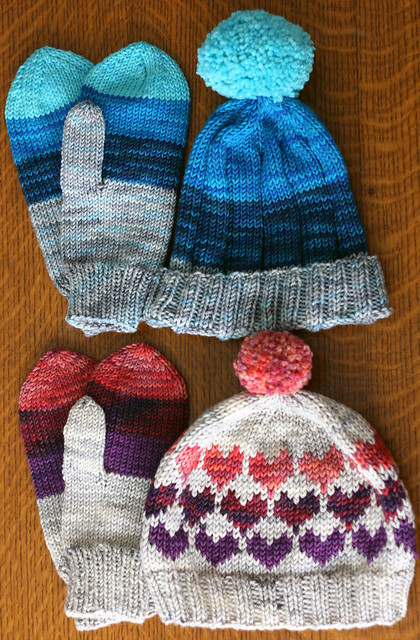 I knit two pairs of mitts and coordinating hats using my Grammy's Hats and Mitts pattern and I love them both. The heart hat obviously had a few mods, I knit the ribbing shorter and instead of knitting the main part of the hat in a wide 6 x 2 rib I knit it plain and added a few cutesy hearts. I love both sets. I will fully admit that the pom-pom on the turquoise hat is bordering on the ridiculously huge. Chris thinks it's too much and got a very good laugh out of me hitting my pop-pom on the door frame when I was trying to get into the car, and getting my scarf caught up in my pom-pom when I was wrapping up to face the cold. It may not be the most practical of proportions, but it's just so darn cute. 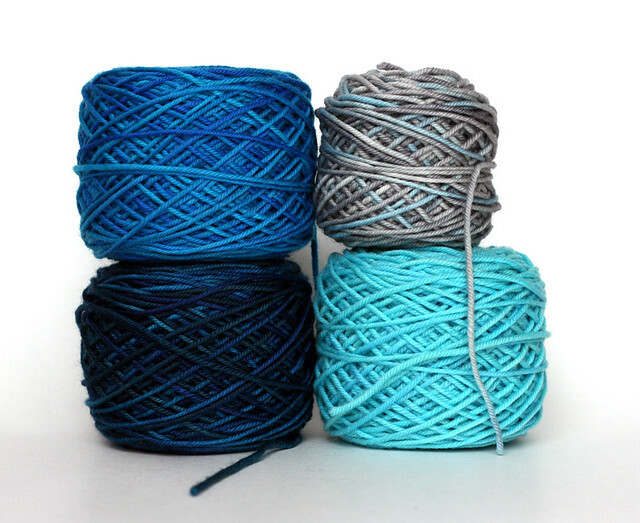 I'm thinking of using the leftovers from my turquoise set (deep sea, peacock, seabreeze and shadow all Green Label) to make Stella a sporty striped sweater. She could use a good dose of stripes in her wardrobe.